Dr. Aurelijus Zykas, Head of the Centre for Asian Studies has published a monograph “Lead by soft power: communication of country’s image and Japan”. It provides analysis on relevant topics that link such fields as public diplomacy, information warfare, propaganda, country’s image and nation branding. The Monograph not only gives an overview of the history and interrelationship of activities related to the management of image communication, but also combines various theoretical approaches. Through the case of Japan, the image communication challenges arising to the states of contemporary World are being discussed. Nowadays image communication practices create numerous dilemmas therefore it has both proponents and opponents. Lithuania is not an exception. On the one hand, an outrage exists in the media over the fact that Lithuania is presented as the motherland of Hannibal Lecter. On the other hand, there is a question, weather tax payers’ money are being used correctly and effectively by investing them into such intangible and rationally hardly explainable activities as cultural diplomacy or brand of the nation. Country’s image is an almost magic cloud of associations and symbols that lingers in the heads of intangible mass of foreigners. Is it safe to state that it is capable to determine such rationally calculated matters as state’s economy, tourism flows or the number of lives lost in wars? The main country, the author is interested in, and of which the most examples are provided in the book, is Japan. It is so not because he personally is involved in it and conducts his major research. 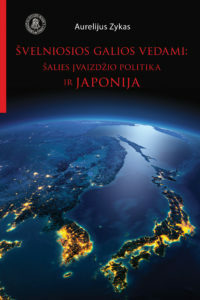 According the author, Japan’s experiences in this field could help Lithuania to find the answers to certain questions while solving dilemmas or choosing tools. Its paperback version will be available in the bookstores soon.